Road closures around Panamints and Titus due to weather, rain, ice, snow per Park Ranger at desk. 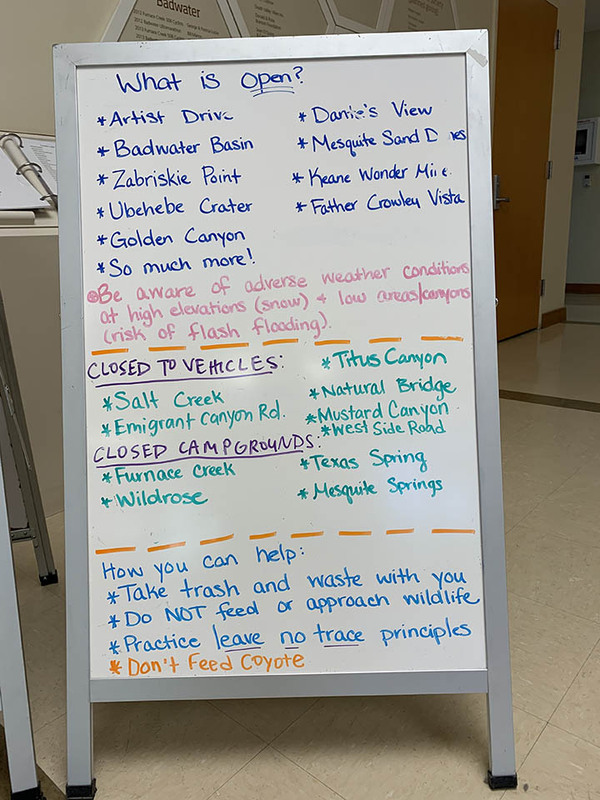 Other closures due to "resource protection" like Salt Creek. Racetrack is always open unless extreme flooding, which is rare. DVNHA is funding VC staffing and opening via donations and mixing their own staff with NPS staff. They seem to be doing a great job under the difficult circumstances. Very windy last night, windy today. Now off to possible approach to Schwab Peak via Hole in the Wall. The ranger I spoke to had just spent the night at the Owlsheads and had a great time with no driving problems but they entered via lower Harry Wade from the east rather than Harry Wade from Badwater. They weren't sure if the water was in the Amargosa River crossing. Nice update, thanks a lot!